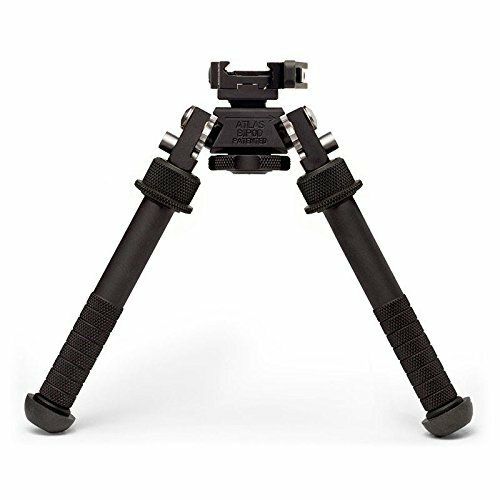 The atlas bipod offers many features that place it in a category of its own. Those features include legs that move independently and can be deployed in a 45 degree position either forwards or backwards, in the traditional 90 degree position, and facing directly to the front or back, locking securely into 5 positions through a 180 degree arc. It provides the shooter with 30 total degrees left to right pan as well as 30 total degrees of cant, making it easy to align your cross hairs on the target regardless of the terrain. Offering the strength and stability that shooters demand, the atlas provides rock solid support while weighing less than 11 ounces. The patented atlas is constructed of the finest materials and built to the highest standards right here in the USA. Mounts directly to any 1913 style pica tinny rail via included dam 170-s lever. Height range approximately 4.75 - 9.0". Weight 12.7 ounces. Available in black only. Height range approximately 4.75 - 9.0"
If you have any questions about this product by AccuShot, contact us by completing and submitting the form below. If you are looking for a specif part number, please include it with your message.